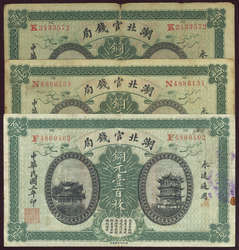 5 Yuan 1925 The Frontier Bank, Harbin, Specimen der Rs, 0-Nummern. 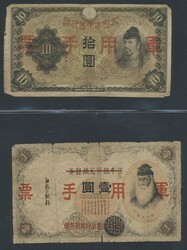 I,...more 5 Yuan 1925 The Frontier Bank, Harbin, Specimen der Rs, 0-Nummern. 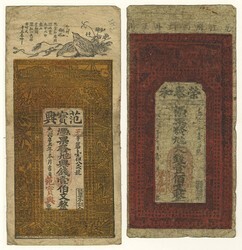 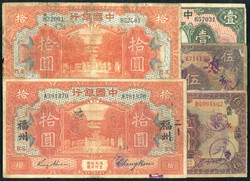 CHINA: 1912 (民國元年) Hunan Bank One Tael 湖南銀行壹兩,...more CHINA: 1912 (民國元年) Hunan Bank One Tael 湖南銀行壹兩, 票號00888, auspicious serial number 00888, rare. 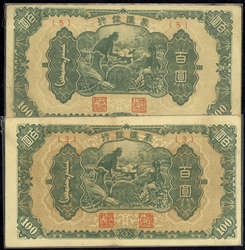 CHINA: 1914 (民國三年) Hupeh Provincial Bank 100 Copper Coins...more CHINA: 1914 (民國三年) Hupeh Provincial Bank 100 Copper Coins 湖北官錢局銅元壹佰枚三張, group of three, VG-F (3). 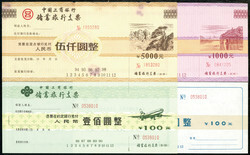 CHINA: 1907 (光緒33年) The Shing Nih Chartered Bank Limited $5...more CHINA: 1907 (光緒33年) The Shing Nih Chartered Bank Limited $5 浙江興業銀行上海通用銀元伍元, scarce, VF-EF. 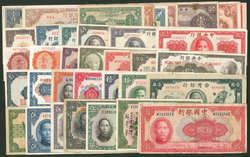 CHINA: 1935-46 Republic Period Banknotes...more CHINA: 1935-46 Republic Period Banknotes 民國時期紙鈔三十七枚, group of thirty seven, mixed condition (37). 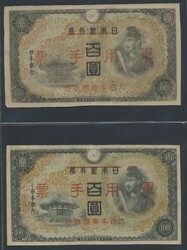 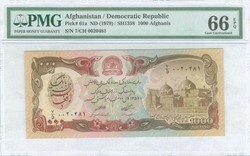 CHINA: Republic Period Mongolia & Sinkiang Bank $100...more CHINA: Republic Period Mongolia & Sinkiang Bank $100 民國時期蒙疆銀行壹佰圓兩張, two examples, EF (2). 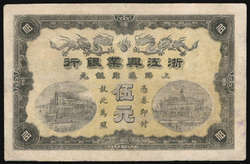 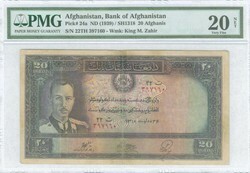 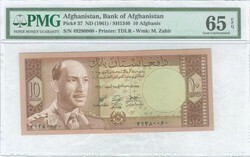 CHINA: 1936-44 Republic Period The Central Bank of China 10c, 20c,...more CHINA: 1936-44 Republic Period The Central Bank of China 10c, 20c, $1, $100 & $500 民國二十五到三十三年中央銀行壹角, 貳角, 壹圓, 壹佰圓和伍佰圓, group of five, AU (5).